Mix eggs, half-and-half, oregano, salt and pepper with fork just until whites and yolks are blended. Heat butter in 10-inch skillet or omelet pan over medium-high heat just until butter is hot and sizzling. As butter melts, tilt pan to coat bottom. Quickly pour eggs into pan. While rapidly sliding pan back and forth over heat, quickly stir with fork to spread eggs continuously over bottom of pan as they thicken. Let stand over heat a few seconds to lightly brown bottom of omelet. Tilt pan and run fork under edge of omelet, then jerk pan sharply to loosen eggs from bottom of pan. Sprinkle with cheese and chilies. Fold portion of omelet just to center. Allow for a portion of the omelet to slide up side of pan. Turn omelet onto warm plate, flipping folded portion of omelet over so it rolls over the bottom. Tuck sides of omelet under if necessary. Top with tomatoes and sour cream; sprinkle with cilantro. Serve with a side of spicy chorizo sausage, fresh melon chunks and piping-hot spicy corn bread. 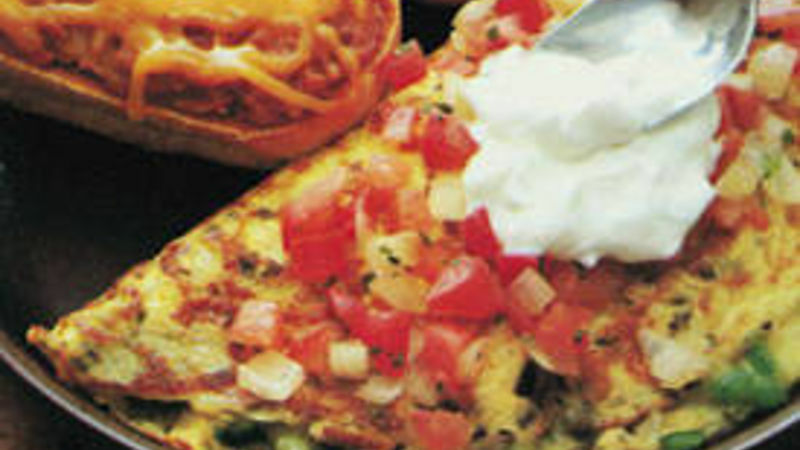 The omelet will continue to cook after it has been folded, so be careful not to overcook it.